Setting and understanding your hourly rate can be empowering for you and your business. Every time you pitch for a job you’ll know what fee to quote. You’ll be able to make business decisions much more easily. Gives you the confidence to stand by your fees and walk away knowing it was the right choice for you. Most of all it ensure you get paid exactly what you need to LIVE. Time is one of your resources in your business and once you know the value of each hour you’ll soon realise that you can’t say yes to every favour or that phone call with a client who always takes half an hour of your day. Once you know the value of your time you’ll think twice before you give it away or perhaps flip the advice you give away into a paid service. Imagine having the confidence to say no, with the knowledge that it is the right decision for you and your business. Well by setting an hourly rate that covers all your costs, salary and tax you’ll know instantly whether work being offered to you meet your salary and business goals. As part of setting your hourly rate you will need to work out how much income you need to earn to cover your costs and tax, setting you a sales target for the year. If you’ve been self employed for a while, calculating your hourly rate is a great checker. Are you charging enough to cover your time? Are you charging a market rate? Can you increase your rates and make more money doing the same work? If they are not, reassess your budget or decline the cost. 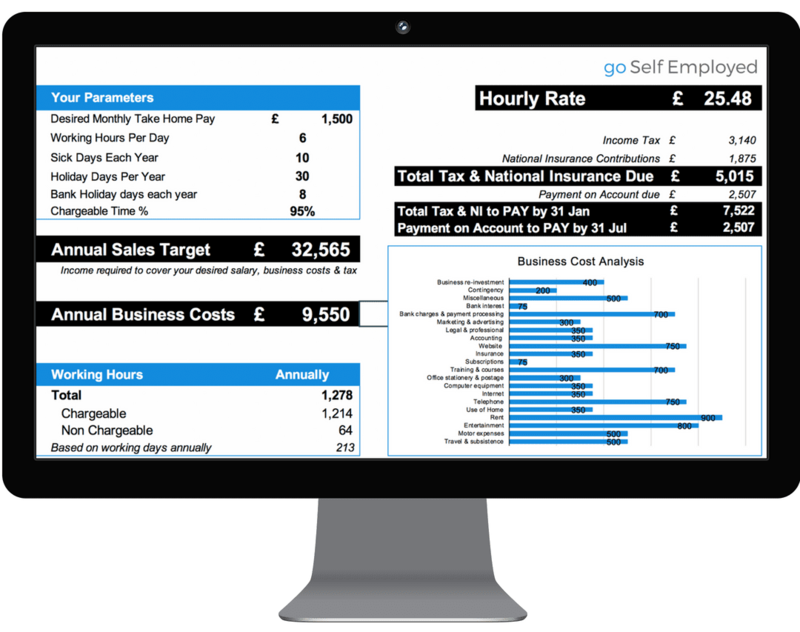 Not sure where to start with calculating your hourly rate? My Hourly Rate Calculator works it all out for you. Just enter your email address below and I’ll send it to you, along with a guide on how to use it and analyse your dashboard.